To Book: Call 07847 309351 to leave a message and someone will contact you as soon as possible. A Spacious Main Hall and Meeting Rooms for Hire, Ideal for Parties and Celebrations. 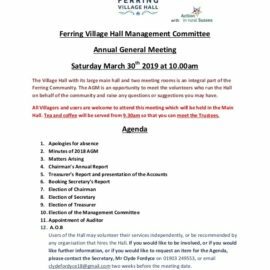 Ferring Village Hall is a Community facility; it has been designed to be as flexible as possible to meet the varying needs of the local community. It contains a spacious Main Hall and two separate meeting rooms called the Club Room and the Griffin Room. Each of these three rooms has a separate kitchen facility. The rooms are centrally heated and are naturally ventilated. The Hall has been designed in accordance with current regulations for disabled parking, disabled access and a disabled toilet. Ferring Village Hall has attained a HALLMARK1 quality of standards scheme for village halls as certified by ACRE (Action in Rural Sussex). A copy of the certificate can be viewed under Downloads. The Village Hall and rooms are available for hire every day between the hours of 8am and midnight or at such other times as the Management Committee may specifically allow. Receptions for weddings, children’s parties etc. The Main Hall with seating for 140 people, a wooden dance floor and a stage at one end of the Hall. The Main Hall has a separate kitchen and its own wc’s. The Club Room with seating for 60 people and a separate kitchen facility. The Griffin Room with seating for 25 people and a separate kitchenette. Parking at the front of the Main Hall for 8 cars plus a disabled parking bay. Wi-Fi access in the Main Hall, Club Room and Griffin Room. Connect to Wi-Fi network BTHub3-M6XK and the password is Griffin1.